Thanks for joining us again, folks! And thank you for your continued support as we show some love to some of the amazing people who have helped this project along. 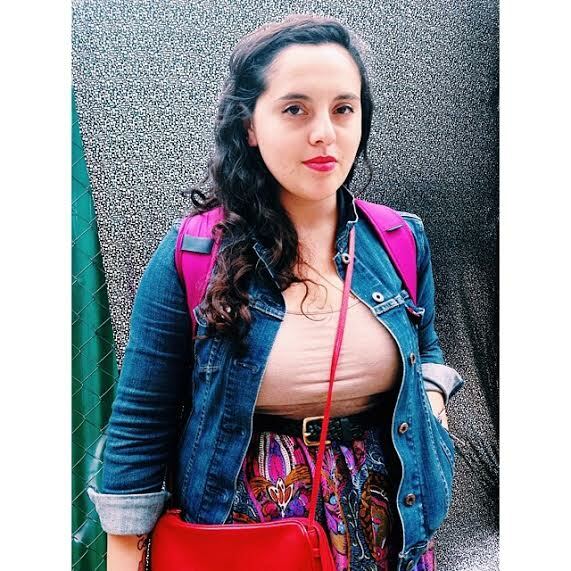 This week, we feature Maribel Falcón, who is currently living in Brooklyn, New York, but spent the past seven years in Austin, Texas. She was the TWP fundraising leader in Austin back in February. Here’s Maribel! Third Woman Press Collective (TWPC): Buenas, Maribel! Can you tell us a little about the organization(s) you’re with and/or what keeps you busy these days? Maribel Catarina Falcón (MCF): At the time of the fundraiser last February, I was working at Mexic-Arte Museum in Austin, TX. I was exposed to how an art institution can provide resources and voice to Latino/a, Latin American, young and women artists. The success of the museum, is in no doubt, due to the work of the founder, Sylvia Orozco, and the curator, Claudia Zapata. Because of the strong artist community in Austin—especially artists of color—we sold artwork as part of the fundraiser. The event was held at 5604 Manor, a local community center that houses organizations like Workers Defense Project and Cooperation Texas. We were lucky to use the space and very grateful for everyone who helped out. 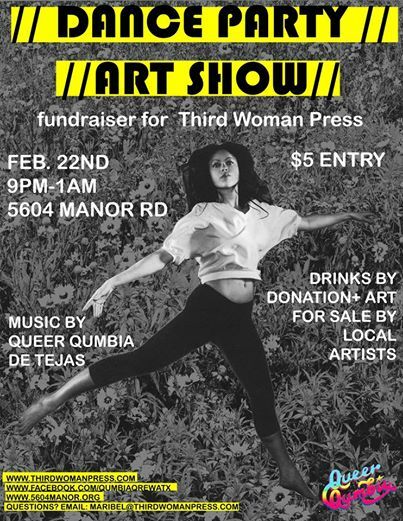 The event allowed various community folks to cross paths in one place, for art and cumbia, all while supporting women of color writers and artists! In New York, I currently spend a lot of time reading, making art, hanging out with friends and exchanging ideas and managing the ups and downs of the city. Some friends of mine and I are having an art show in Brooklyn on August 15th, so we’re super busy preparing for that. TWPC: That’s so awesome! Good luck with the show. We loved the art and artists you were able to bring in to the fundraiser in Austin. Tell us, what influenced your decision to help fundraise for Third Woman Press? MCF: Last fall, my amiga and TWP fundraising coordinator, Brenda Rodriguez, was looking for someone in Austin to host an event. Austin is a great city to host community events that involve the arts, music and dancing. 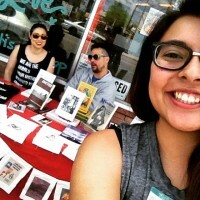 After I asked Rocio Villalobos, community worker extraordinaire, and Itzel Martinez, media student and artist, to help plan, I knew I had the resources and support. Our communities need a lot of financial support, oftentimes from grants, but most importantly from those around us. It really wasn’t a question of whether or not to do the event. Of course we would help out Third Woman Press; the being work done is too close to home. 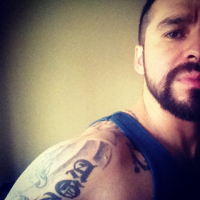 We’ve all read This Bridge Called My Back, the book that carried a collective pain, love and power. Without the poetry, creative writing, and testaments to our experiences, we’d be even more lost as feminists of color. But it is when we can see ourselves in the pages, when we too have books with names like ours on the shelves in the bookstore, that we can affirm our existence more and more. TWPC: That’s so true. That’s why we’re working so hard over here at Third Woman Press. The Collective strongly believes in the power of representation—the power of seeing our own stories of ourselves in print, as you said. In what ways do you think art can help feminism and vice versa? MCF: Art and our social critique of it is essential to life. When womyn can create, in whatever ways they choose, whether it’s writing or painting or photography or sewing or gardening or having children, they are making art. Through the act of creation, they empower themselves more. If being feminist is fighting for your right to make the art—and that art empowers you because it is yours and not just inspired by you—then art and feminism are interconnected and dependent on each other. TWPC: Brenda had told us about your understanding of and commitment to the power of artistic representation, and that’s why we knew you’d be perfect as our mover-and-shaker in Austin! Can you tell us your favorite part of the fundraising art show/dance party you organized? MCF: Well, I was running around the whole time, but from what others told me, everyone had a great time! I was so excited that almost all the artwork sold and that everyone was excited about their new pieces as well. Many folks bought the work based on their connection to it, not knowing the artist was even in the room with them! Some of the artwork was donated by professional working artists, but most of it was provided by friends I knew could be creative and make something. When all the work was put on the walls, you could see the range in concepts and mediums, as well as gender, age, race and even daytime occupation. The music, of course, was amazing by Queer Qumbia (en Tejas). They’re a collective of community folks who throw parties filled with artists, community folks, queer and trans inclusive safe spaces for everyone. They are a blast. 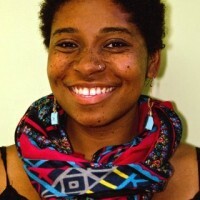 TWPC: We love Queer Qumbia! We’ll need to throw another party with them soon, and we hope you can join us, so you can just enjoy the scene next time. (Two weeks ago, we learned that Chris Davila likes to dance, so we’ll have to invite her, too.) We know a lot of our readers are emerging feminist artists. What advice would you give to them as they come into their own? MCF: Any advice I would give is what I tell myself everyday. Be strong and continue making work. 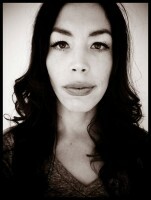 I think declaring oneself an artist is one of the most difficult identities we can affirm or deny. Growing up, I was culturally isolated from anyone who made a living with art. I had vaguely heard of artists in the male-dominated, Western canon—names I won’t even repeat to further reinforce their place in art history. There have always been women artists, but their work is less recognized. Male artists oftentimes refer to women as “muses” instead of collaborators. A woman’s agency is often stripped from her position in the artworld, and that has to change now. No one told me I could be an artist, and, in fact, I feel like everything in society still tells me I can’t be. Men dominate the art worlds of fashion, film, fine art, photography, book publishing, academia and more, and when women are present, they are usually White women. Given this obvious racial disparity, when womyn of color artists and intellectuals step into this niche, they are either exocitized and/or not taken seriously by the dominant group. How can we make art when we are constantly working at maintaining ground? Despite all that, womyn of color continue to make art. We decorate ourselves with jewels. We pick out the nicest dresses for church or the dances. We are the interior designers of our small humble casas or spaces. We make trinkets as regalos, and we usually give it all away. I think we’re already doing what we need to do. I only stress that we continue to support each other in our work, a work that is spiritual and deep, a work that we are forced to do because we know it is what is necessary for us to continue. Generations before us sharpened the tools, prepared the comida, hemmed the dresses and still took the time to teach the next generation how to do so. I believe strongly in mentorship and am extremely grateful for the women in my life who have guided me, including my peers, some whom I don’t even see regularly but still inspire me by the lives they live. These womyn are strong, intelligent and build bridges in all the work they do. I’m also a product of the women in my family: my mother, grandmother and great grandmother, who made quilts and clothes. They inspire me and have planted a seed. We can inspire the mujeres around us to do the same, and together our work can help future generations. TWPC: Aww, you inspire us, Maribel. The Collective is also committed to intergenerational mentorship and healing. People like Norma Alarcón and Ana Clarissa Rojas Durazo have been guiding the Collective in the past year, and we hope we can do the same for the next Collective of feminists who will be doing the work that matters. Besides the arts, what other field, space, or area do you feel really needs a feminist intervention right now? MCF: Everything in society needs a feminist invention, especially because poor and working-class, third-world womyn are the ones making the world run. I think amongst ourselves we have to have the most compassionate interventions. 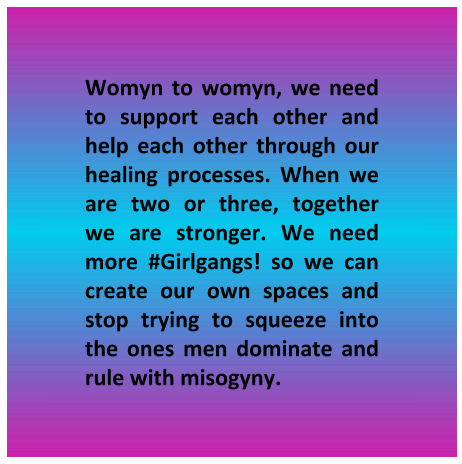 Womyn to womyn, we need to support each other and help each other through our healing processes. When we are two or three, together we are stronger. We need more #Girlgangs! so we can create our own spaces and stop trying to squeeze into the ones men dominate and rule with misogyny. TWPC: You’re right. We have to remind each other that we need feminism everywhere, every day, all day. So, here’s the last question: since you helped TWP raise money, what is one thing that excites you about its revitalization? Or what would you like to see TWP do soon or in the future? MCF: I’m very excited to see that TWP is growing, although we all knew it would. Sara is doing an amazing job at leading the effort and the Collective is inspiring through all its work in different places. 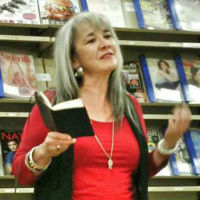 As a press that nurtures writers, TWP can influence youth to express themselves through creative writing. The kids in our communities (and their families) go through so much, and they need outlets to help them process their experiences and move forward. With that said, I’d like to see the Press grow into publishing all types of genres by womyn of color authors, such as children’s books, young adult novels, poetry, university textbooks, science-fiction writing, photography, and—maybe one day—even a big, oversized art book! That is a long term goal, I’m sure, but not impossible. TWPC: We’re dreaming big, too, Maribel! Thank you for sharing your thoughts with us. We hope your words have been as inspiring to our readers as they have been for us today. Now, let’s all get back to doing the work that matters for ourselves, our communities, and our world!